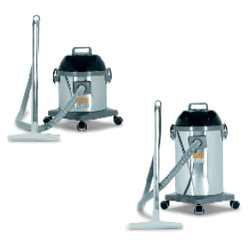 We are involved in offering the Silent Line- Wet & Dry- Steel Tanks that are used for various light and medium industrial vacuum cleaning operations. Designed and developed using advanced technological standards, our range is highly acknowledged for high efficiency and accurate performance. Available in various models and technical specifications, we can also customize our range as per the requirements of clients.